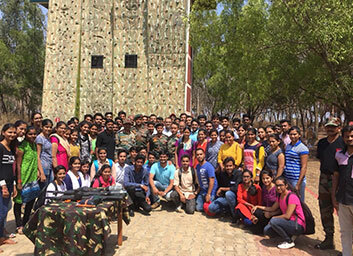 A unique visit to Military Commando Training Centre, Belagavi was organized for students of KLS IMER on 20th April 2018. The visit included a demonstration of Commando Training, Jungle Survival Strategies, Snake Handling and Intrusion Detection System. Rigorous 35 days of training is given to commandos across the world and Belagavi is the only prestigious center in India to provide such training. Under the leadership of Major General Sanjay Soi, Commander JL Wing and Col. S Chatterjee, YSM Commander, their team demonstrated live sessions on various commando training modules and interacted with students of KLS IMER. Prof. Ajay Jamnani and Col. Rumale N.P of KLS IMER initiated and arranged the visit. Students and faculties of KLS IMER had great learning experience during the visit.